Can I Put Clear Varathane Over Latex Paint? Varathane is a water-based polyurethane sealer that adds shine to wood and latex-painted surfaces. The sealer also protects surfaces from scratches, marks, yellowing and staining. You can apply Varathane to any surface containing interior and exterior latex paint, including walls, tables, chairs and workbenches, once the paint is dry. The sealer dries clearly and quickly without the need of any special tools. Use a clean paintbrush to apply Varathane to a latex-painted surface. Wipe the latex-painted surface with a clean, soft cloth or rag to remove any loose dust and debris. Sand the surface with a piece of 150- or 220-grit sandpaper to dull any gloss the surface may have and to smooth out any imperfections. Wipe the surface with a wet cloth or rag to remove any sand dust and debris. 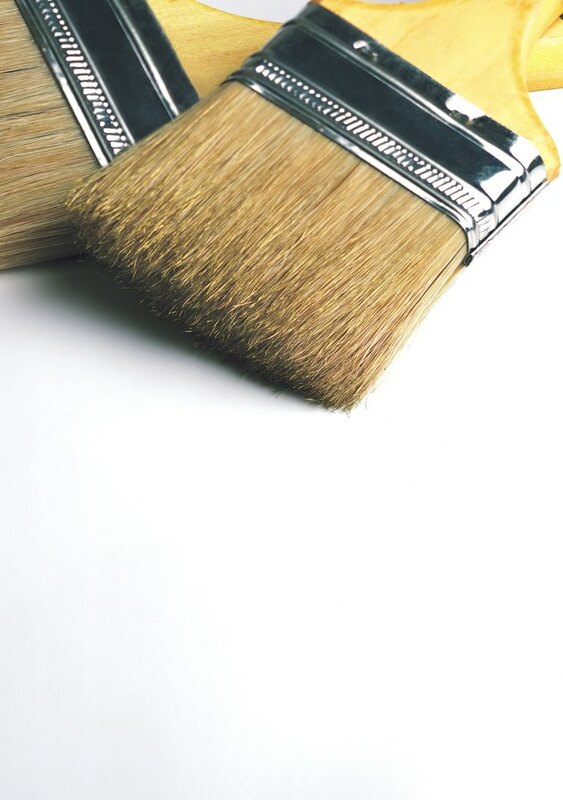 Use a synthetic-bristle paintbrush to apply the sealer evenly to the latex-painted surface. Let the first coat dry until it is sticky to the touch, and then apply a second coat. Let the second coat dry until sticky and then apply a third coat. Do not wait too long between coats; this will cause the Varathane to appear dull once it is dry. If you do wait too long, sand the surface lightly with a piece of 150- or 220-grit sandpaper, and wipe it clean before applying an additional coat of Varathane. Follow any and all recommendations on the can of Varathane. If using Varathane on exterior surfaces, the outside wall or structure must contain latex paint designed for exterior surfaces, otherwise the sealer will not coat the surface properly. Applying interior Varathane to an exterior surface will also cause the sealer to not coat properly, and it will wash off once it rains or the surface is exposed to moisture. Use exterior Varathane on exterior surfaces and interior Varathane on interior surfaces. Use soapy water and a clean sponge or rag to keep surfaces sealed with Varathane clean. Avoid using harsh- and alcohol-based cleaners; these substances will dull and damage the Varathane sealer and possibly remove the sealer. Interior and exterior Varathane sealers, as well as paintbrushes and sandpaper, are available at hardware, home improvement and retail superstores. The sealers and supplies are also available from online hardware and retail outlets. Varathane sealers vary in price and packaging. Can You Use Varnish Over High-Gloss Paint Trim? Can You Stain Over Sanded Varnish?